These highlights do not include all the information needed to use NAFTIFINE HYDROCHLORIDE CREAM USP, 2% safely and effectively. See full prescribing information for NAFTIFINE HYDROCHLORIDE CREAM USP, 2%. To report SUSPECTED ADVERSE REACTIONS, contact Impax Laboratories at 1-800-934-6729 or FDA at 1-800-FDA-1088 or www.fda.gov/medwatch. Additional pediatric use information for patients aged 2 years to less than 18 years is approved for Merz Pharmaceuticals, LLC’s NAFTIN (naftifine hydrochloride) cream. However, due to Merz Pharmaceuticals, LLC’s marketing exclusivity rights, this drug product is not labeled with that pediatric information. Naftifine Hydrochloride Cream USP, 2% is indicated for the treatment of interdigital tinea pedis, tinea cruris, and tinea corporis caused by the organism Trichophyton rubrum. For topical use only. Naftifine Hydrochloride Cream, 2% is not for ophthalmic, oral, or intravaginal use. Apply a thin layer of Naftifine Hydrochloride Cream, 2% once-daily to the affected areas plus a ½ inch margin of healthy surrounding skin for 2 weeks. Each gram of Naftifine Hydrochloride Cream, 2% contains 20 mg of naftifine hydrochloride (2%) in a white to off-white base. Discontinue treatment if irritation or sensitivity develops with the use of Naftifine Hydrochloride Cream, 2%. Direct patients to contact their physician if these conditions develop following use of Naftifine Hydrochloride Cream, 2%. During clinical trials, 760 subjects were exposed to naftifine 1% and 2% cream formulations. A total of 421 subjects with interdigital tinea pedis and/or tinea cruris were treated with Naftifine Hydrochloride Cream, 2%. In two randomized, vehicle-controlled trials (400 patients were treated with Naftifine Hydrochloride Cream, 2%). The population was 12 to 88 years old, primarily male (79%), 48% Caucasian, 36% Black or African American, 40% Hispanic or Latino and had either predominantly interdigital tinea pedis or tinea cruris. Most subjects received doses once-daily, topically, for 2 weeks to cover the affected skin areas plus a ½ inch margin of surrounding healthy skin. In the two vehicle-controlled trials, 17.5% of Naftifine Hydrochloride Cream, 2% treated subjects experienced an adverse reaction compared with 19.3% of vehicle subjects. The most common adverse reaction (≥1%) is pruritus. Most adverse reactions were mild in severity. The incidence of adverse reactions in the Naftifine Hydrochloride Cream, 2% treated population was not significantly different than in the vehicle treated population. In one open-label pediatric pharmacokinetics and safety trial, 22 pediatric subjects 13- to <18 years of age with interdigital tinea pedis and tinea cruris received Naftifine Hydrochloride Cream, 2%. The incidence of adverse reactions in the pediatric population was similar to that observed in the adult population. The following adverse reactions have been identified during post-approval use of naftifine hydrochloride: redness/irritation, inflammation, maceration, swelling, burning, blisters, serous drainage, crusting, headache, dizziness, leukopenia, agranulocytosis. Because these reactions are reported voluntarily from a population of uncertain size, it is not always possible to reliably estimate their frequency or establish a causal relationship to drug exposure. There are no available data with Naftifine Hydrochloride Cream, 2% in pregnant women to inform the drug-associated risk for major birth defects and miscarriage. In animal reproduction studies, no adverse effects on embryofetal development were seen at oral doses administered during the period of organogenesis up to 18 times the maximum recommended human dose (MRHD) in pregnant rats or subcutaneous doses administered during the period of organogenesis up to 2 times the MRHD in pregnant rats or 4 times the MRHD in pregnant rabbits [see Data]. Systemic embryofetal development studies were conducted in rats and rabbits. For the comparison of animal to human doses based on body surface area comparison (mg/m2), the MRHD is set at 8 g 2% cream per day (2.67 mg/kg/day for a 60 kg individual). Oral doses of 30, 100 and 300 mg/kg/day naftifine hydrochloride were administered during the period of organogenesis to pregnant female rats. No treatment-related effects on embryofetal development were noted at doses up to 300 mg/kg/day (18 times MRHD). Subcutaneous doses of 10 and 30 mg/kg/day naftifine hydrochloride were administered during the period of organogenesis to pregnant female rats. No treatment-related effects on embryofetal development were noted at 30 mg/kg/day (2 times MRHD). Subcutaneous doses of 3, 10 and 30 mg/kg/day naftifine hydrochloride were administered during the period of organogenesis to pregnant female rabbits. No treatment related effects on embryofetal development were noted at 30 mg/kg/day (4 times MRHD). A peri- and post-natal development study was conducted in rats. Oral doses of 30, 100 and 300 mg/kg/day naftifine hydrochloride were administered to female rats from gestational day 14 to lactation day 21. Reduced body weight gain of females during gestation and of the offspring during lactation was noted at 300 mg/kg/day (18 times MRHD). No developmental toxicity was noted at 100 mg/kg/day (6 times MRHD). There is no information available on the presence of Naftifine Hydrochloride Cream, 2% in human milk, the effects of the drug on the breastfed infant, or the effects of the drug on milk production. The lack of clinical data during lactation precludes a clear determination of the risk of Naftifine Hydrochloride Cream, 2% to an infant during lactation; therefore, the development and health benefits of breastfeeding should be considered along with the mother’s clinical need for Naftifine Hydrochloride Cream, 2% and any potential adverse effects on the breastfed infant from Naftifine Hydrochloride Cream, 2% or from the underlying maternal condition. The safety and effectiveness of Naftifine Hydrochloride Cream, 2% have been established in pediatric patients age 12 and above with interdigital tinea pedis and tinea cruris [see Clinical Studies (14) and Clinical Pharmacology (12.3)]. Use of Naftifine Hydrochloride Cream, 2% in this age group is supported by evidence from adequate and well controlled studies in adults and children, with additional safety and PK data from one open label trial conducted in 22 pediatric subjects exposed to Naftifine Hydrochloride Cream, 2% [see Clinical Studies (14) and Clinical Pharmacology (12.3)]. Safety and effectiveness of Naftifine Hydrochloride Cream, 2% in the treatment of tinea cruris and interdigital tinea pedis in pediatric patients less than 12 years of age have not been established. Clinical studies of Naftifine Hydrochloride Cream, 2% did not include sufficient numbers of subjects aged 65 and over to determine whether they respond differently from younger subjects. Naftifine Hydrochloride Cream USP, 2% is a white to off-white cream for topical use only. Each gram of Naftifine Hydrochloride Cream USP, 2% contains 20 mg of naftifine hydrochloride (2%), a synthetic allylamine antifungal compound. Chemically, naftifine HCl is (E)-N-Cinnamyl-N-methyl-1-napthalenemethylamine hydrochloride. The molecular formula is C21H21N•HCl with a molecular weight of 323.86. Naftifine Hydrochloride Cream USP, 2% contains the following inactive ingredients: benzyl alcohol, cetyl alcohol, cetyl esters wax, isopropyl myristate, polysorbate 60, sodium hydroxide, sorbitan monostearate, stearyl alcohol and purified water. Hydrochloric acid may be added to adjust pH. Naftifine Hydrochloride Cream, 2% is a topical antifungal drug [see Clinical Pharmacology (12.4)]. The pharmacodynamics of Naftifine Hydrochloride Cream, 2% have not been established. In vitro and in vivo bioavailability studies have demonstrated that naftifine penetrates the stratum corneum in sufficient concentration to inhibit the growth of dermatophytes. The pharmacokinetics of Naftifine Hydrochloride Cream, 2% was evaluated following once-daily topical application for 2 weeks to 21 adult subjects, both males and females, with both tinea pedis and tinea cruris. The median total amount of cream applied was 6.4 g (range 5.3-7.5 g) per day. The results showed that the systemic exposure (i.e., maximum concentration (Cmax) and area under the curve from time 0 to 24 hours (AUC0-24)) to naftifine increased over the 2 week treatment period in all the 21 subjects. Geometric mean (coefficient of variation or CV%) AUC0-24 was 117 (41.2) ng*hr/mL on Day 1, and 204 (28.5) ng*hr/mL on Day 14. Geometric mean (CV %) Cmax was 7 ng/mL (55.6) on Day 1 and 11 ng/mL (29.3) on day 14. Median time to Cmax (Tmax) was 8.0 hours (range 4-24 hours) on Day 1 and 6.0 hours (range 0-16 hours) on Day 14. Accumulation after 14 days of topical application was less than two fold. Trough concentrations generally increased throughout the 14 day study period. Naftifine continued to be detected in plasma in 13/21 (62%) subjects on day 28, the mean (standard deviation or SD) plasma concentrations were 1.6 ± 0.5 ng/mL (range below limit of quantitation (BLQ) to 3 ng/mL). In the same pharmacokinetic trial conducted in patients with tinea pedis and tinea cruris, median fraction of the dose excreted in urine during the treatment period was 0.0016% on Day 1 versus 0.0020% on Day 14. In a second trial that enrolled 22 subjects, the pharmacokinetics of Naftifine Hydrochloride Cream, 2% was evaluated in 20 pediatric subjects 13 to <18 years of age with both tinea pedis and tinea cruris. Subjects were treated with a median dose of 8.1 g (range 6.6-10.1 g) applied to the affected areas once daily for 2 weeks. The results showed that the systemic exposure increased over the treatment period. Geometric mean (CV%) AUC0-24 was 138 (50.2) ng*hr/mL on Day 1, and 192 (74.9) ng*hr/mL on Day 14. Geometric mean (CV %) Cmax was 9.21 ng/mL (48.4) on Day 1 and 12.7 ng/mL (67.2) on day 14. Median fraction of the dose excreted in urine during the treatment period was 0.0030% on Day 1 and 0.0033% on Day 14. Although the exact mechanism of action against fungi is not known, naftifine hydrochloride appears to interfere with sterol biosynthesis by inhibiting the enzyme squalene2, 3-epoxidase. This inhibition of enzyme activity results in decreased amounts of sterols, especially ergosterol, and a corresponding accumulation of squalene in the cells. To date, a mechanism of resistance to naftifine has not been identified. Long-term studies to evaluate the carcinogenic potential of Naftifine Hydrochloride Cream, 2% have not been performed. Naftifine hydrochloride revealed no evidence of mutagenic or clastogenic potential based on the results of two in vitro genotoxicity tests (Ames assay and Chinese hamster ovary cell chromosome aberration assay) and one in vivo genotoxicity test (mouse bone marrow micronucleus assay). Oral administration of naftifine hydrochloride to rats, throughout mating, gestation, parturition and lactation, demonstrated no effects on growth, fertility or reproduction, at doses up to 100 mg/kg/day (6 times MRHD). Naftifine Hydrochloride Cream, 2% has been investigated for safety and efficacy in a randomized, double-blind, vehicle-controlled, multi-center trial in 146 subjects with symptomatic and dermatophyte culture positive tinea cruris. Subjects were randomized to receive Naftifine Hydrochloride Cream, 2% or vehicle. Subjects applied Naftifine Hydrochloride Cream, 2% or vehicle to the affected area plus a ½-inch margin of healthy skin surrounding the affected area once-daily for 2 weeks. Signs and symptoms of tinea cruris (presence or absence of erythema, pruritus, and scaling) were assessed, and KOH examination and dermatophyte culture were performed at the primary efficacy endpoint at week 4. The mean age of the trial population was 47 years and 87% were male and 43% were white. At baseline, subjects were confirmed to have signs and symptoms of tinea cruris, positive KOH exam, and confirmed dermatophyte presence based on culture results from a central mycology laboratory. The analysis of the intent-to­treat population was a comparison of the proportions of subjects with a complete cure at the week 4 visit (see Table 1). Complete cure was defined as both clinical cure (absence of erythema, pruritus, and scaling) and mycological cure (negative KOH and dermatophyte culture). The percentage of subjects experiencing clinical cure and the percentage of subjects experiencing mycological cure at week 4 are presented individually in Table 1 below. a. Complete cure is a composite endpoint of both mycological cure and clinical cure. Clinical cure is defined as the absence of erythema, pruritus, and scaling (grade of 0). b. Effective treatment is a negative KOH preparation and negative dermatophyte culture, erythema, scaling, and pruritus grades of 0 or 1 (absent or nearly absent). c. Mycological cure is defined as negative KOH and dermatophyte culture. Naftifine Hydrochloride Cream, 2% has been investigated for efficacy in a randomized, double-blind, vehicle-controlled, multi-center trial in 217 subjects with symptomatic and dermatophyte culture positive interdigital tinea pedis. Subjects were randomized to receive Naftifine Hydrochloride Cream, 2% or vehicle. Subjects applied Naftifine Hydrochloride Cream, 2% or vehicle to the affected area of the foot plus a ½-inch margin of healthy skin surrounding the affected area once-daily for 2 weeks. Signs and symptoms of interdigital tinea pedis (presence or absence of erythema, pruritus, and scaling) were assessed and KOH examination and dermatophyte culture was performed at the primary efficacy endpoint at week 6. The mean age of the trial population was 42 years and 71% were male and 57% were white. At baseline, subjects were confirmed to have signs and symptoms of interdigital tinea pedis, positive KOH exam, and confirmed dermatophyte culture. The primary efficacy endpoint was the proportions of subjects with a complete cure at the week 6 visit (see Table 2). Complete cure was defined as both a clinical cure (absence of erythema, pruritus, and scaling) and mycological cure (negative KOH and dermatophyte culture). The efficacy results at week 6, four weeks following the end of treatment, are presented in Table 2 below. Naftifine Hydrochloride Cream, 2% demonstrated complete cure in subjects with interdigital tinea pedis, but complete cure in subjects with only moccasin type tinea pedis was not demonstrated. a. Complete cure is a composite endpoint of both mycological cure and clinical cure. Clinical cure is defined as absence of erythema, pruritus, and scaling (grade of 0). b. Effective treatment is a negative KOH preparation and negative dermatophyte culture, erythema, scaling, and pruritus grades of 0 or 1 (absent or near absent). 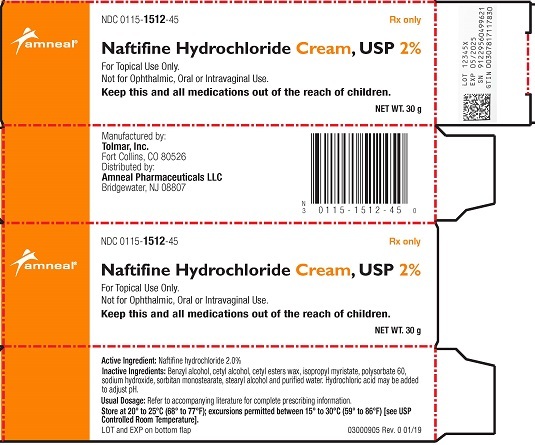 Store Naftifine Hydrochloride Cream USP, 2% at 20° - 25°C (68° - 77°F); excursions permitted to 15° - 30°C (59° - 86°F) [see USP Controlled Room Temperature]. Inform patients that Naftifine Hydrochloride Cream, 2% is for topical use only. Naftifine Hydrochloride Cream, 2% is not intended for oral, intravaginal or ophthalmic use. If irritation or sensitivity develops with the use of Naftifine Hydrochloride Cream, 2% treatment should be discontinued and appropriate therapy instituted. Patients should be directed to contact their physician if these conditions develop following use of Naftifine Hydrochloride Cream, 2%.